Syrah vs Shiraz – same grape variety but different styles of wine. The use of the name Syrah indicates that the wine is made similar to a complex French style Syrah, instead of your typical fruit dominated, American oaked, Aussie Shiraz. The Canberra District has a well-deserved reputation for producing exceptional cool-climate Shiraz/Syrah comparable to that of the Rhone Valley in France. 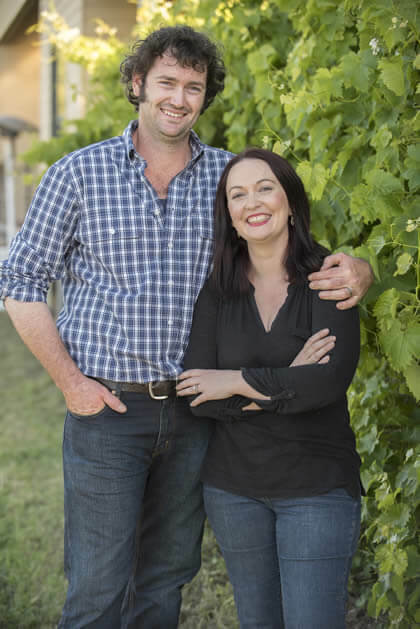 After purchasing the winery and vineyard formerly known as Yass Valley Wines in 2014, Stephanie and Ben were delighted to find established Shiraz vines thriving in the ancient granite based volcanic soils. With a little bit of TLC these vines are consistently producing perfect fruit for our wines. Unpredictable weather characterised the 2015-16 growing season, however, we seemed to end up with perfect conditions for each stage of grapegrowing. A very warm spring encouraged fast vine growth and was perfect for flowering and fruit set. The wettest January since 1995 increased soil moisture and reduced the need for supplementary irrigation. An exceptionally warm Autumn sped up ripening and concentrated flavours. site. A 3 day cold soak prior to fermentation and the inclusion of whole bunches in the ferments ensured maximum colour and flavour extraction. The wine was then pressed to a mixture of old and new French oak and allowed to mature for 16 months. Each block was kept separate during fermentation but blended together after tasting trials in the final months of maturation. Chocolate, vanilla and violets on the nose. Savoury and peppery with ripe plum and blackberry flavours and a hint of liquorice. Soft tannins and lively acidity on the finish. Serve with rich foods, barbequed meats and vegetables, stews and casseroles, aged cheeses.